Interior Shutters as shown on the photo of this Hampshire home have been designed with the Open Sky Hidden Push Road system pioneered by Shutterly Fabulous. Shutters with this design see the push rod which holds the slats of the shutters together, concealed at the back of the shutters and the slats are tilted by holding any one of the slats. Interior shutters were traditionally designed with a push rod on the front of the plantation shutters and holding this rod resulted in the slats tilting. Tastes of interior shutters have changed over the past few years. Now, around 60% of Shutterly Fabulous customers choose to buy their interior shutters without the visible push rod on the front of the shutters and instead opt for the hidden push system which has a concealed rod on the rear of the interior shutters panels. 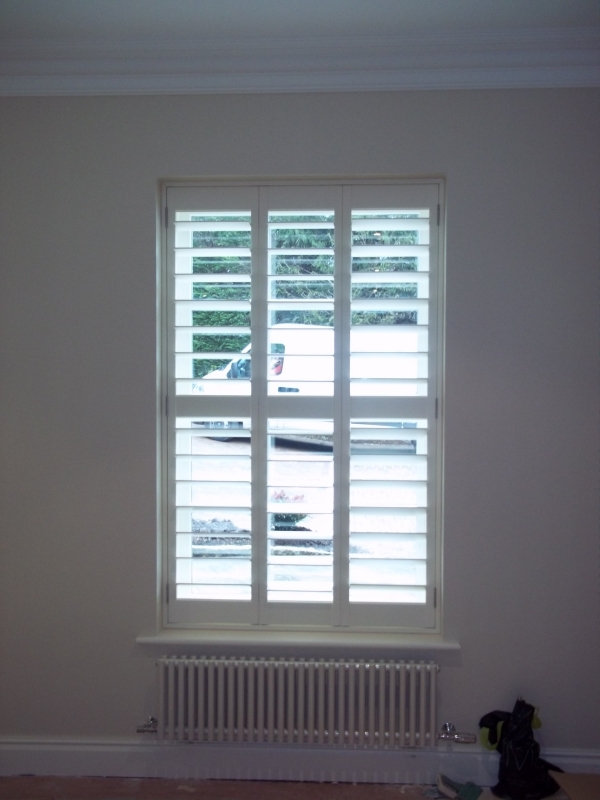 Interior shutters which feature this design are not only suited to ultra modern homes. The shutters in this photo were installed in a Hampshire cottage which had many traditional period features and look quite suited to this Hampshire home. As you can see in this photo, this window features vertical divides which break the window into 3 sections. Shutterly Fabulous therefore designed the interior shutters to compliment the window design and there are 3 shutters panels on this window which are hinged to open 2 panels to the left, and 1 of the interior shutters to the right. If you look at the interior window shutters that are folded over to the left, because the shutters have bi-folded onto each other, you are looking at the front of the shutter panel. On the right hand shutter, you are looking at the back of the shutter panel. For those residents of the County of Hampshire, our window shutters can be viewed in the Southampton Furniture Village Store. I want to make sure that my window shutters look nice. I didn’t know that you could have hidden push rods! That would make the shutters look so fancy.